ABC has been in the doldrums lately, finishing in fifth place—behind Univision—at the end of December. So it may come as no surprise that the network is aggressively going after new material, and even after sizable orders for new comedy and drama pilots, the network has still signed up eleven more shows. First, the dramas. From Sheldon Turner, whose writing career has spanned an Oscar nomination for Up In The Air as well as remakes of The Longest Yard and The Texas Chainsaw Massacre, comes The Advocate, which is based on the real-life story of Turner’s former agent, Byrdie Lifson-Pompan. The agent had a brain tumor go undetected after a misdiagnosis, and though she eventually made a full recovery, several of her family members suffered misdiagnoses as well. This prompted her to switch careers and become a patient advocate. It could be a refreshing new take on the well-worn medical drama, or it could be The Longest Yard meets The Texas Chainsaw Massacre set in a hospital. The former is a lot more likely, but—admit it—the latter would be pretty awesome. Can drilling for oil in Teddy Roosevelt’s head be far behind? Less ripped-from-the-headlines as ripped-from-the-fever-dreams of ExxonMobil stockholders, Boom is set during a fictional oil boom in which North Dakota is revealed to have a reservoir of crude that rivals that of Saudi Arabia. As the series begins, a young couple strikes out for the oil fields hoping riches await, and they meet “roughnecks, grifters, oil barons, criminals, and fellow prospectors” along the way. Presumably, one of those people will attempt to drink their milkshake. Not to be confused with The Advocate, The Adversaries is built around a New York legal dynasty whose patriarch ends up in trouble, forcing his daughter—a federal prosecutor—to pick sides. Rounding out the drama pickups is Kingmakers, which is about a young man who infiltrates a university’s Skull And Bones-type society after his sister is found murdered during her freshman year at the school. Of the seven comedy pilots in this most recent round of pickups, two come from Galavant creator Dan Fogelman. One, The King Of 7B, is about a shut-in who leaves his apartment for the first time in decades when he decides that his new neighbor could be his soulmate. The other is a yet-untitled comedy created in partnership with the NBA’s Golden State Warriors (Synergy!). As we’ve previously reported, it’s about an NBA rookie who speaks no English and a translator who doesn’t understand basketball, following in the footsteps of so many sports-themed sitcoms about characters who don’t speak English. A few more familiar names are contributing comedies. 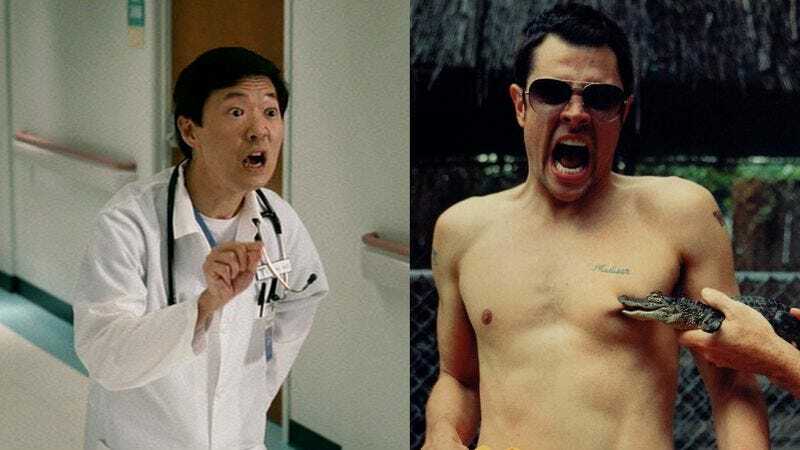 Johnny Knoxville is producing and narrating an also-untitled sitcom based on his life and the “outlaw culture” of his family, and Community’s Ken Jeong is starring in Dr. Ken—a show that was previously in development at NBC. Jeong was a physician before he got into comedy, so he’ll probably be tapping into his life experiences as well. CollegeHumor regular Jermaine Fowler has an autobiographical sitcom pilot as well. Titled Delores & Jermaine, it’s about a directionless millennial who moves in with his strict ex-cop grandmother. We assume Fowler plays the grandmother. Finally, the network has two shows about exceptional kids. The first (also untitled) involves an intellectual couple whose son is a gifted athlete, forcing them to deal with the hyper-competitive world of youth sports. The second is “inspired by” Kip and Mona Lisa Harding’s book The Brainy Bunch, which is about their experiences raising a large brood of geniuses who have limited social skills. These pickups bring the network’s new pilot total up to twenty, which is a lot, considering there are 21 hours in the primetime schedule. So, either some of these shows won’t make it to fall, or expect a sitcom about teenage genius athlete shut-in Johnny Knoxville joining Skull And Bones to drill for oil with his grandmother, while Dr. Ken runs as a crawler during Scandal’s commercial breaks.